In this article, we will walk through the functionality for the unpublished page of the pitch module in a huddle. We will cover how to create , edit, and manage a pitch module. 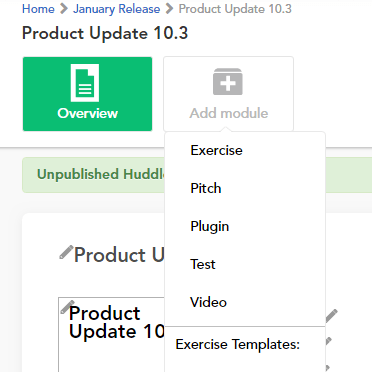 To create a pitch module, go into the “Edit” mode of the huddle to make it unpublished then select “Add Module” then “Pitch”. You can create/add a pitch module to any huddle. The pitch module has 4 parts that can be edited those are: Name, Module Type, Reviewer Settings, Scorecard. The name of the pitch module is defaulted to “Pitch” and it is the only required field within the edit page. You can update the name anytime even after publishing the huddle and editing again. This part allows you to choose if the pitch module should be optional for the participant to complete. If it is set to optional, the participant is not required to complete it and any action in the pitch module will not affect completion of the huddle. This part allows you to set specific settings for reviewers in the pitch module. A reviewer is someone who is scoring and/or commenting on a pitch within the module. 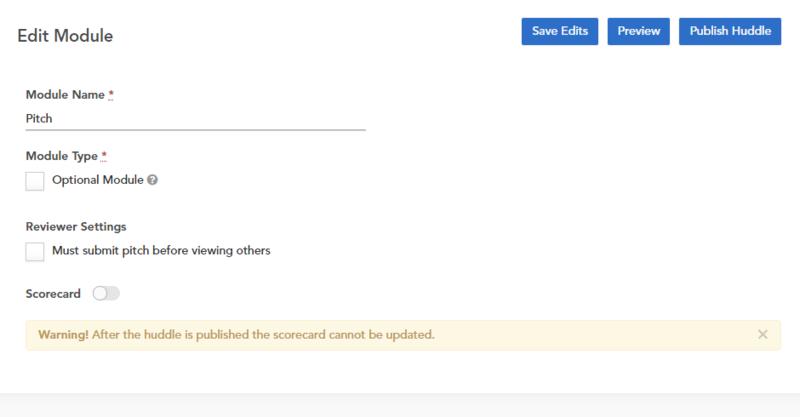 This part is where you can manage the Scorecard for participants of the pitch module. The Scorecard is default off, however, by clicking on the switch it can be turned on. If you publish a huddle with the Scorecard off, it cannot be turned on. The pitch module will need to be cloned to create a new Scorecard that can be turned on. When the Scorecard is on, you can add up to 4 criterion’s to the pitch. These are what the reviewers will base the reviews on. To edit the criterion, click on the defaulted text like “Clear” and add a name. To remove a criterion, simply click on the “X” for that criterion. 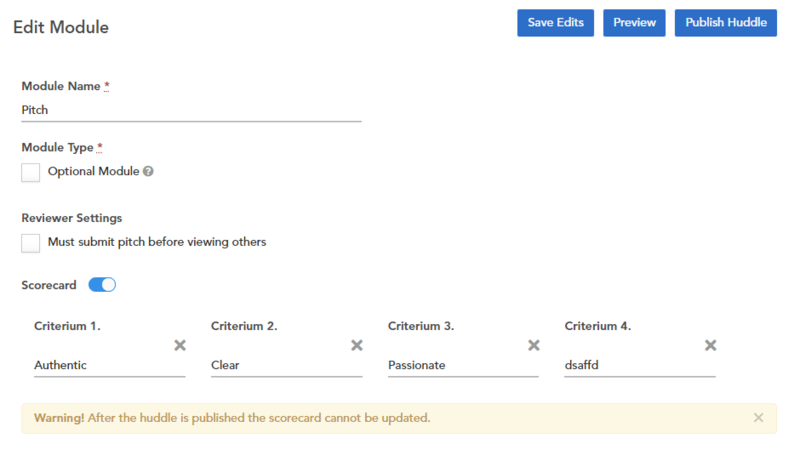 To add back a criterion click on the “Add Scorecard” button, the name is not defaulted for this one so it is required to add a name or the criterion will not appear.